We’d love your help. 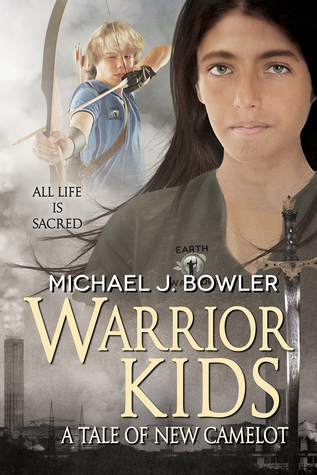 Let us know what’s wrong with this preview of Warrior Kids by Michael J. Bowler. The future looks bleak unless eighteen year-old Lance and his New Camelot Earth Warriors can save the planet from catastrophic climate change. His involvement leads t The future looks bleak unless eighteen year-old Lance and his New Camelot Earth Warriors can save the planet from catastrophic climate change. Having adopted his father’s philosophy of doing what’s right, rather than what’s easy, Lance makes serious enemies when he calls out New Camelot donors who represent fossil fuel or other polluting industries, and then barely escapes a series of "accidents” designed to kill him. When he challenges the United States Congress to step up and act immediately on the climate crisis, the attacks on him escalate. With the majority of America's kids on his side, Lance and his young Earth Warriors prepare for the United Nations Conference of the Parties in Paris, where they will call upon world leaders to stop talking about sustainability and start acting on it. But whoever wants him dead isn't giving up. Will Lance and his crew live long enough to even get to Paris? To ask other readers questions about Warrior Kids, please sign up. Source: I received a digital copy of this book from the author in exchange for a honest review, thanks to Michael J Bowler! This book is important! As a Geography student I support the whole Save the Earth idea and this book really promoted that and as a middle grade book, it is so educational to teach younger kids how to battle climate change. Also it has a lo Source: I received a digital copy of this book from the author in exchange for a honest review, thanks to Michael J Bowler! Also it has a lot of action so it teaches them about it in a pretty cool way. I love the story of King Arthur, it was my favourite story growing up and when people do adaptions of Camelot, I'm immediately obsessed! Another thing that I loved about this book is that I didn't have to read the series that goes along side this book. It stands alone brilliantly! in his writing, he knows how to keep the child AND adult entertained! keeping a good future for the next generations, will LOVE this book! treat. It helps to reinforce what a good world means to our family. Keep it up Bowler you know exactly how to keep it real! rate this book an AWESOME FIVE FAMILY PLANET FRIENDLY STARS! just can't wait to read more from this author! It's unusual to see a middle-grade novel steeped in different themes often directed to adult audiences: political strug Warrior Kids: A Tale of New Camelot is set in New Camelot, where eighteen-year-old Lance and his Earth Warriors are battling climate change. It would seem unlikely that a youth-led movement can save the earth from its own inhabitants, but Lance's movement is spreading across America, attracting friends and making enemies alike. The question is: can they really make a difference? The story of Camelot evolves as their mission broadens to address the most pressing issue for millennials, the environment. If they don’t act now, the future will not bode well for future generations. Environmentally concerned readers will especially enjoy the challenge those fighting to protect our planet as they face a well-financed greedy corporate structure that puts profits before the welfare of people and the planet. There are people out there pushing for change by mobilizing people to take action. Some lose sight of the big picture and are lost along the way while others fall prey to their own notoriety. Will leadership arise that can unite these scattered voices into a unified voice? These are some of the questions wrapped up in this novel. Are millennials up to the challenge? Do they have a strong enough voice to be heard? Michael sees possibilities as he spins a fictitious story that may inspire others to speed up the process of change. Though I am not a teenager by many years, I identify with the millennials who face a daunting challenge in changing people’s minds away from the “me” and to the “we” as survival ultimately depends on the health and wellbeing of our planet. In a consumption driven economy, can we shift away from want and instead focus on what we need? Michael also included a list of activities for those who would like to become an Earth Warriors in their own community. Warrior Kids is book six in the Knight Cycle series, while being a standalone book it drops you right into the middle of the series and the plot lines. It becomes clear in the first few chapters, to a new reader, that this book and probably the entire series is about Lance, the "King" of New Camelot, and his Earth Warriors. A group of older kids, mostly those lost in the system, ages ranging from 10- early 20's. This group, these Earth Warriors, are taking on first big business, then Congress an Warrior Kids is book six in the Knight Cycle series, while being a standalone book it drops you right into the middle of the series and the plot lines. It becomes clear in the first few chapters, to a new reader, that this book and probably the entire series is about Lance, the "King" of New Camelot, and his Earth Warriors. A group of older kids, mostly those lost in the system, ages ranging from 10- early 20's. This group, these Earth Warriors, are taking on first big business, then Congress and finally the United Nations to force them to stop talking about a sustainable planet and start doing something to attain it. Though like any story dealing with change on any level there are those who oppose the Earth Warriors and are willing to do everything it takes to stop Lance and his team, even if it means taking him out of the equation, permanently. While wonderfully written and quite engaging for a YA book, the toting of a standalone book is wrong. You need to read the others to get the full back story. I recommend it. But only after you've read the first 5 books. It's been nearly a year since Arthur left to return to Avalon to await the day he might be needed again. Excalibur has chosen Lance to lead this new generation. Since completing their previous quest things have been relatively quiet around New Camelot. But now they have taken up the mantle of a new quest. But this time they are not just looking nationally, they are now looking globally. And, once again, there are those that want to stop "The boy who came back". But can they succeed? This book is It's been nearly a year since Arthur left to return to Avalon to await the day he might be needed again. Excalibur has chosen Lance to lead this new generation. Since completing their previous quest things have been relatively quiet around New Camelot. But now they have taken up the mantle of a new quest. But this time they are not just looking nationally, they are now looking globally. And, once again, there are those that want to stop "The boy who came back". But can they succeed? Not being familiar with the series this is spun off of, I handed it to my twelve year old to read and review, as it something that seemed to be in his interests. He handed it back fairly quickly, complaining that it was like studying for a test. That was not was I expected from a fantasy kids novel. It didn’t take me long to figure out what he meant. There were so many facts thrown into just a few pages of the first chapter, I could see how it might be overwhelming. It was a trend that continued Not being familiar with the series this is spun off of, I handed it to my twelve year old to read and review, as it something that seemed to be in his interests. He handed it back fairly quickly, complaining that it was like studying for a test. That was not was I expected from a fantasy kids novel. It didn’t take me long to figure out what he meant. There were so many facts thrown into just a few pages of the first chapter, I could see how it might be overwhelming. It was a trend that continued through the entire book, often upstaging the story. To be honest, if I had not made a promise to review the book, I wouldn’t have finished it either, which would have been a shame. I wanted to like it. It is a terrifically written, well paced action story with plenty of vibrant personable characters, written in language that is imminently relatable to the twelve to fourteen year old kids, I am assuming, are its target audience. It is about kids achieving great things. It should have been a great read. Once I got used to the environmental treatise vibe there were even many things I liked about it. For instance, the hero is a real hero and exactly the self effacing type of person who should be leading and the kind of hero kids should be reading about. I like the way that the politically charged issue of climate change is handled and the call for recognition and compromise between the two sides. I like the erasing of labels and pointing out that no one specific group of people is the most responsible for the environmental problems facing the world. I love the “We” versus “Me” mentality. I did like the admission that lower income families will find it more difficult to adopt the lifestyle being requested, a fact most Green Gurus tend to overlook in their zealousness. I can definitely see the Arthurian themes running this story and the selflessness engendered in the myth is certainly the germ of this tale as well. There is also a fairly comprehensive list of kid-friendly resources to help kids become eco-warriors, in addition to the much mentioned 50 ways list from the book. What I didn’t like about the book was pretty much a deal killer, even for fiction. I have seen many times, first hand, the change that kids my son’s age are capable of achieving and I do believe that his generation will be one of greatness for the world when those kids are allowed to become leaders. Also, I firmly believe children should be encouraged at this age to be aware of how government works and to communicate with those in government who represent them. No one takes governing more seriously than a group of twelve to seventeen year old kids on a student council. I have personally seen just such a group of kids that age take on a state senator with detailed questions that conveyed just how dialed in they are to issues that affect themselves and their communities. I just can- not- get on board with the methodology used in this book to take on big government, even knowing that is fiction and agreeing with the outcome. Finally, the adults against the kids thing was just too much. Adults are not inherently evil, hypocritical, unmotivated, or motivated by vice, not anymore than teens are lazy, apathetic, or insolent. This book will find an audience, it is after all a well written story as its many higher rated reviews will attest to. It did make me curious about the series of books this is related to and it did do its job in making me think. Ultimately, I think it pushed too hard. It reminds me of a young man in this book actually. As for fun reading fiction I can’t give this more than a 3 rating. However, this book’s amazon page offers an e-book edition to educators for free if they contact the author by email or social media. From an educational viewpoint, I can definitely see its usefulness a jumping off point in opening discussion to sustainability and the role of government. I’ll compromise on the rating. The future looks bleak unless eighteen-year-old Lance and his New Camelot Earth Warriors can save the planet from catastrophic climate change. Spurred by twelve year-olds Billy, Enya, Itzamna, and his ten-year-old brother, Chris, Lance creates a branch of Earth Warriors, a youth-led movement designed to save the earth from its greatest enemy – greed. His involvement leads to Earth Warrior crews springing up all across America. Millions of kids leap into action, paralyzing the country and alarming the rich and powerful. Having adopted his father’s philosophy of doing what’s right, rather than what’s easy, Lance makes serious enemies when he calls out New Camelot donors who represent fossil fuel or other polluting industries, and then barely escapes a series of "accidents” designed to kill him. When he challenges the United States Congress to step up and act immediately on the climate crisis, the attacks on him escalate. With the majority of America's kids on his side, Lance and his young Earth Warriors prepare for the United Nations Conference of the Parties in Paris, where they will call upon world leaders to stop talking about sustainability and start acting on it. But whoever wants him dead isn't giving up. Will Lance and his crew live long enough to even get to Paris? Warrior Kids is a standalone tale set within the Children of the Knight universe. This story was a modern day adventure with a legend twist in it. It was about kids that have come together to be heard and to help others and the planet. There are many things about this book I liked. I love the fact that the kids of today were given a voice as to what can be done to help others and the planet. It was not so much adults telling them what to do but kids ranging in age from 5- 18. There is added activities to do on your own or that if this book were used in a class could engage the students more in the story and the world. There is also a list of information of things that we can do to help our planet. This was a book that actually wedded my appetite to read the other books in this series. It may have been a stand alone in the series, but I could see how it would also fit into the series as a sequel to it. I was hooked from page one and stayed all the way through. It was full of adventure from beginning to end. The legend aspect added to the story without overpowering it. I also loved the added features. I loved that they dealt with the topic of race discrimination. It was tactfully done and went showed how a person who was prejudiced toward another would feel and act. What I did not like was my usual use of swearing. Although I can see where as orphans the usage of swearing is a normal thing. I would edit that part out if I was reading to younger kids, as this is a book that would engage the interest of even a 5 year old. Other than that I did not see anything that was really bad about the book. As you know I rate things not as stars but with this rating. #2 Share and tell- Buy one copy to keep and one or more copies to share telling others about it. #3 Donation- These are great reads for a one time read for me. #4 Chuckers/ Fire starters- These are books that I either could not get into or they were written poorly. These then become great fire starters. This is a book that I definitely would recommend to others and will be keeping a copy or me. This was a strong 2. There was no graphic violence and the swearing was kept at a minimal. As a parent I would read it to my kids and use the added features. Lance has a new mission, but no less vital than children’s rights. He’s now taking up his friend Itzali’s cause - climate change. After all, what’s the point of kids having rights when they don’t have a decent world to live in? But just like before, he’s making some powerful enemies and might bring about change, but at the cost of his own life. Following up on his previous series, author Michael Bowler continues with the characters from his Knight Cycle books. Continuing with his mix of Arthuria Lance has a new mission, but no less vital than children’s rights. He’s now taking up his friend Itzali’s cause - climate change. After all, what’s the point of kids having rights when they don’t have a decent world to live in? But just like before, he’s making some powerful enemies and might bring about change, but at the cost of his own life. Following up on his previous series, author Michael Bowler continues with the characters from his Knight Cycle books. Continuing with his mix of Arthurian values in modern society, and strange fascination with long, luscious locks, he sets youth as the real heroes against one of society’s biggest scientific issues, that of climate change. Like with the previous books, the results on adults are a bit far fetched, but nice to imagine. I love the emphasis on chivalry and camaraderie, and remember wishing as a kid that adults would take me more seriously (and the reverse - now as an adult wishing they wouldn’t.) The language was certainly juvenile, right down to spelling because or ‘cause as “cuz,” which I’m proud to say would have annoyed me as a child, as I was a grammar nerd then too. I thought it was an ok read, with a good plot timing, although details left me rolling my eyes at times. Still not a bad afternoon of reading, and hopefully inspiring to the YA set. I have to say, I really enjoyed this book – more than I originally thought I would. I’m not much for middle grade fiction, although I do occasionally read it. The story makes for great reading and is very interesting. I did find myself wishing I’d been able to read the actual Children of the Knight series before reading this book, because things from the series were mentioned in this standalone novel that confused me a bit. This book is meant to be a kind of boost to kids to show that kids can hav I have to say, I really enjoyed this book – more than I originally thought I would. I’m not much for middle grade fiction, although I do occasionally read it. This book is meant to be a kind of boost to kids to show that kids can have an impact and that kids can get things done when it comes to things like protecting the environment. It also teaches that it is better to be self-less than to be selfish. Which is a very good thing, because I see all too much of that “me” attitude in kids today. There are even tips in the back for how kids can start helping to save the environment. However, I would caution both parents and children that it is most likely not possible to do all fifty of the tips—even for adults—so do not be disappointed if you are unable to do all of them, very few people would be able to. All in all, the book is a wonderful book with a great story behind it and a great message.